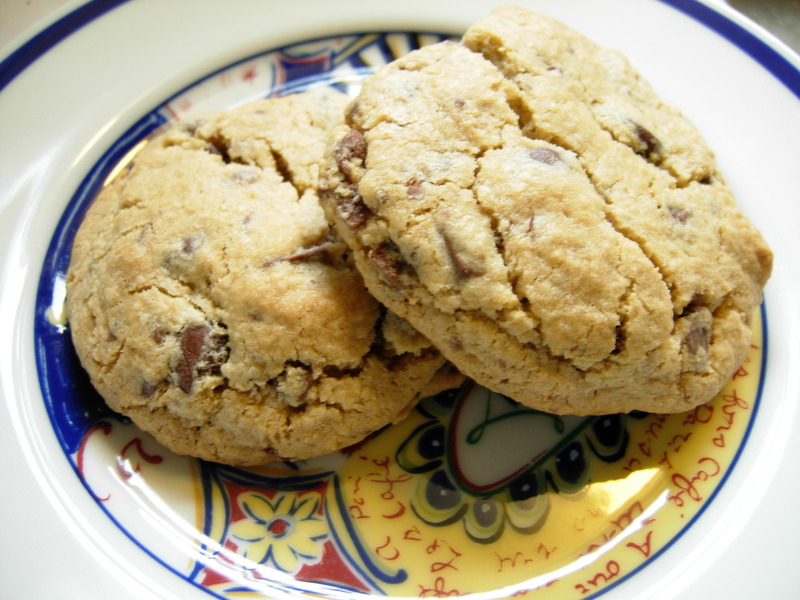 Working on the theory that you can never try too many chocolate chip cookie recipes, here is another one. We had some visitors again this weekend and the boys decided we would make homemade cookies. Will has this giant set of cookie recipes he received last Christmas. Somehow they managed to come up with a “working” pile of 19 to choose from. Clearly, Colin can’t read because I am sure there were recipes in there that he would refuse. I narrowed it down to those recipes that did not require a trip to the store and we settled on MONSTER CHOCOLATE CHIP COOKIES (requires all caps, don’t ya think?). They were large indeed and a little crunchier than I expected. Sadly, though, not my favorite Chocolate Chip cookie recipe. Let’s face it. There are things in life that you appreciate but you can see how it took a lifetime to discover them. We couldn’t go straight from three channels with no remote (not including youngest child in the room, of course) to DVR complete with caller ID on the TV (praise be!). Other things, however, seem so obvious it is shocking that they weren’t around sooner. We didn’t have DVRs in the 70s but we had flavors for crying out loud. Why we were all stuck with mint toothpaste is a wonder. We had Velcro long before parents were freed from the daily hourly burden of re-tieing a four old’s sneaker. My purple Trapper Keeper was really the best use for the stuff? Following this train of thought, it came as a complete and utter shock for me to realize that I entered middle age** before I had ever had brownie and cookie together. Really? These aren’t at my local bakery much less produced and waiting for my children at the local convenience store? Shocking. Dorie missed her chance for millions I think. Clearly, we enjoyed these. Some members of my family really enjoyed them and they were gone by nightfall. No joke. Patty put them on her Dorie top 5 list (which seems a wee bit bigger than five these days, but I am not going to nitpick when it comes to positive feedback). The differences between the layers weren’t as pronounced as I thought they would be but I don’t think it mattered in the end. We will definitely make these again. I should probably go for the gusto and make a whole batch next time but I am not sure they would last any longer. Thanks to Beth at Supplicious for an awesome recipe! The full recipe is at her site. Check out the other brownies here. ** Splicht. Plooey. Splatt. It is difficult for me to write middle-aged but, since 74 seems firmly in the senior citizen camp, I suppose I am obliged. Reluctantly. Apple pie is often cited as the quintessential American dessert. I guess the imagery works, but we all know that chocolate chip cookies are really the most popular. 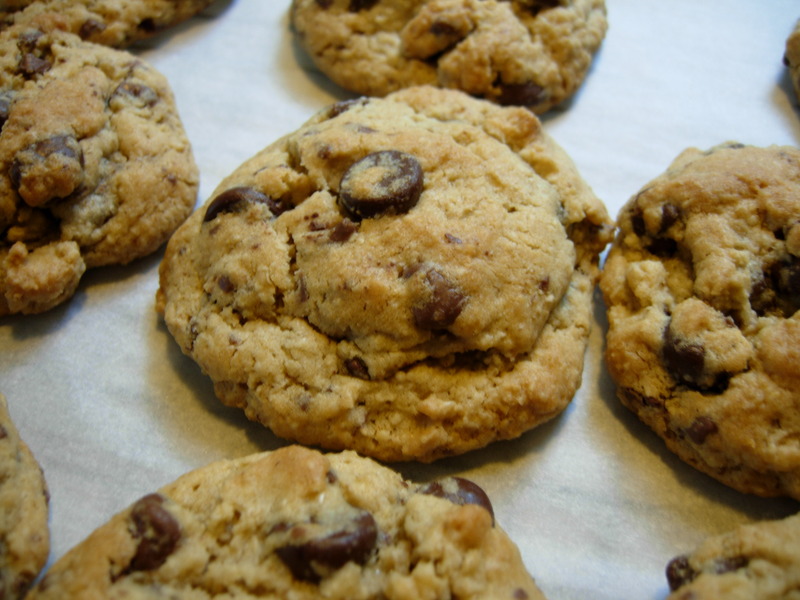 We eat them from childhood through adulthood and I would be willing to wager that a lot of people who would never consider themselves bakers (expert, amateur or otherwise) have attempted a chocolate chip cookie. 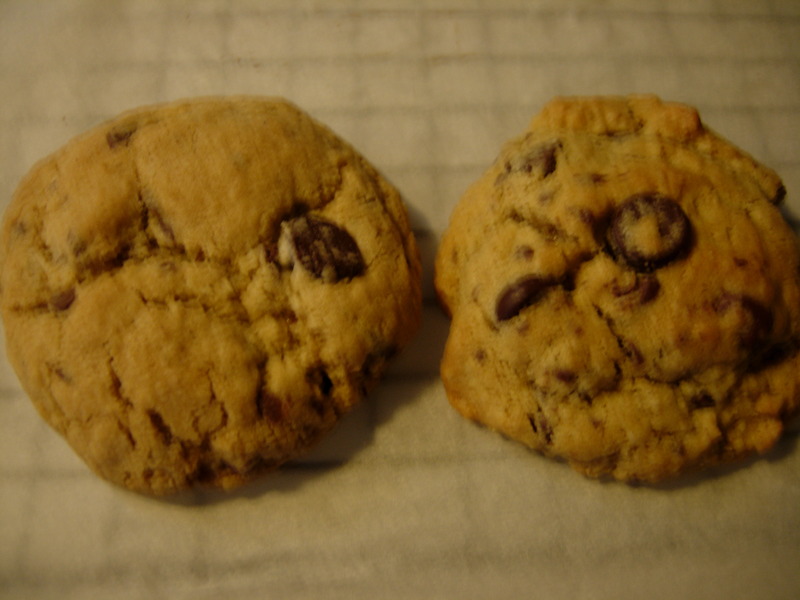 If I was on the proverbial desert island and allowed only one dessert it would be a toss-up between a chocolate malt and chocolate chip cookies. I grew up on Toll House which my mom made really well. But I have tried lots of different recipes. I am always looking for the perfect one. Well, the New York Times had an article on the ultimate chocolate chip cookie recipe last week. Apparently, one of the big secrets to a fabulous cookie is to let the dough rest in the fridge. For a long time. Yeah, right. Cuz I always plan ahead for chocolate chip cookies. Please. it’s a victory if I don’t burn my mouth on a hot chip. But I was curious. I really wanted to try the recipe from the paper which is the culmination of their “research.” Unfortunately, I didn’t have any cake flour and bread flour on hand and the recipe calls for both. Next weekend! I decided to test the resting theory with a recipe (below) I use fairly often. For their research they tested the dough immediately, at 12 hours, 24 hours and 36 hours and, sure enough, 36 hours was the best. For the particulars about the resting period check out the article. I don’t have time (or the available calories) for quite so much testing. So, the kids and I tested immediately. Duh. If your kids see you making chocolate chip cookie dough, you had best be ready to get some in the oven. The first batch. One of the other tips was to make them big. They were good. You can’t go wrong with a warm cookie from the oven. yum! I don’t know if it was the power of suggestion but the cookies did seem to taste better. Moister even. I can’t wait to try with the other recipe next week! The cookies side by side. The one on the right is the later batch. It is more crinkly and a little darker…which is completely unnoticeable in this fine picture. Cream the butter and both sugars. Add eggs and vanilla; mix together with flour, oatmeal, salt, baking powder, and soda. Add chocolate chips and milk chocolate. Roll into almost golf ball size balls and place two inches apart on a cookie sheet. Bake for 14-16 minutes at 350 degrees.